Last month we talked about relationships and adding value to a proposal for an existing relationship. This month I would like to discuss what to do when you don’t have a relationship with a particular company or person but you would like to partner with them. 2020 is just around the corner and that is why you should really start now building a relationship. Let’s say you have been wanting to partner with an energy drink company but you don’t know anyone at the company nor do you know someone that does. In this case you should start to do some research and look at ways to building a relationship. Research: The internet is full of great information and company’s websites will supply you a lot of valuable information. In my research for this article, I searched energy drink websites and found several that were even offering sponsorship’s and were looking for ambassadors of the brand. I even found one that was offering to hire representatives of the brand! What better way to get you and your race program in the door than to be hired by the company you want to represent! You can use this information to your advantage, sign up for one of their programs, or submit your proposal right there on their website. The best tip I can give you and I give my clients often is: pick up the phone and call the marketing director and ask them what they are looking for in a marketing partner. Yes, it is just that simple and more times than not, they will talk to you and tell you exactly what they are looking for. Let them know that you are a customer and ask if they were looking to hire a race team as a marketing partner, what would they be expecting from you. Ask questions to find out if they are more interested in leads, sales, or both. All this information will help us to put a more attractive proposal together that will increase your odds of obtaining a sponsorship. Building the relationship: If you made the phone call as suggested above, you have already started the process of building the relationship. By talking with the company, you are showing seriousness and commitment to being a great marketing partner. But it is time to take action. If you follow me on Facebook, you know that I consistently talk about adding value by saying, “it’s more about what you can do for them, than what they can do for you”. It is most important when building a relationship to adhere to this. For example, if you came to me looking to partner with an energy drink company, I would recommend to you that you offer to put some large decals of their logo on your car (that you pay for) and partner up with their ambassador/marketing team and spend the day at one of their retail stores giving out samples. Again, this shows commitment on your part, but not only commitment but your potential of being a good marketing partner. Even if the marketing director turns your offer down, they will know you are serious. They may even counter with another way that you can assist in their marketing efforts. This is all about offering them something and asking for nothing in return. Later we can put a proposal together that will be taken serious because of your efforts to build the relationship. About the author: Jeff Lambert is the President of Armed Forces Racing and founder of racesponsorships.net. Jeff has a passion to grow the sport of sportsman drag racing by helping grass roots racers improve their race programs through sponsorship’s. 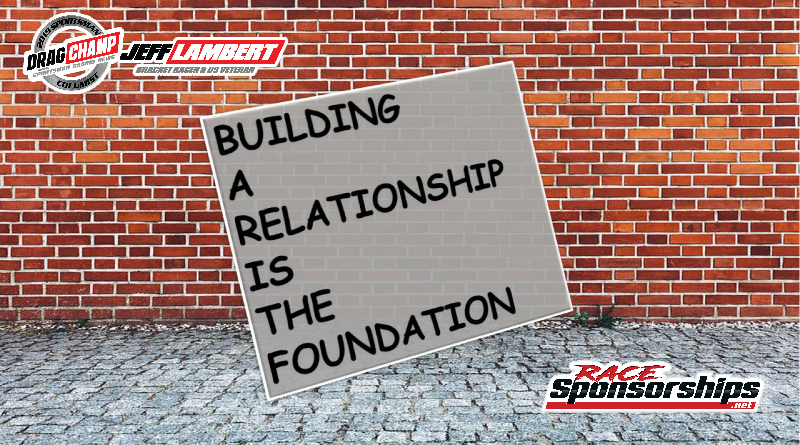 During the next 12 months Jeff will be sharing articles that will guide you to ways of funding your race program through sponsorship’s by obtaining marketing partners. You can connect with Jeff on Facebook at @racesponsorships.net or email jeff@dragchamp.com.